Get a unique view of the water and the city aboard a kayak—rent one from Northwest Outdoor Center (2100 Westlake Ave N; nwoc.com)—while paddling Lake Union near Gas Works Park (2101 N Northlake Way). This vantage is perfect for photographers who are aiming for a bit of nature to go along with their sweeping skyline shots. Views from the park on dry land are equally stunning. In the heart of Capitol Hill, Volunteer Park (1247 15th Ave E), is full of spectacular sights. Climb the 107 steps to the top of the water tower for a peek from up high, or peer through the unique Black Sun sculpture outside the Seattle Asian Art Museum (*1400 E Prospect St; seattleartmuseum.org) to catch a glimpse of the Space Needle in a picture-perfect frame. 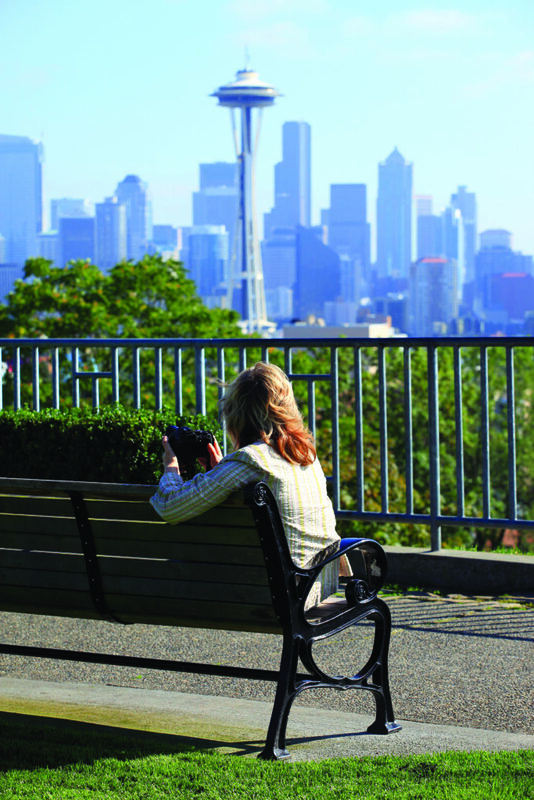 If you’re searching for views of that classic Seattle skyline, look no further than quaint Kerry Park (211 W Highland Dr) in the Upper Queen Anne area. This small greenspace affords great visual payoff, featuring a gorgeous backdrop of Elliott Bay, the Space Needle, downtown’s skyscrapers, and—on a clear day—even Mount Rainier. For a quintessential Seattle snapshot, hop aboard a state ferry (801 Alaskan Way; wsdot.wa.gov/ferries) and see the cityscape framed by dramatic mountain peaks and miles of sparkling water. The downtown ferry terminal is also within walking distance of the Seattle Great Wheel (*1301 Alaskan Way; seattlegreatwheel.com)—another unique spot for view seekers.